I was in Mumbai earlier this month and all I could think about was getting some of those Lush bath bombs to try out.. Unfortunately, even after doing a bit of Googling with the limited wi-fi, the internet failed to inform me that the two Lush stores that was closest to the hotel where I was staying is closed! Talk about a waste of time.. and energy! 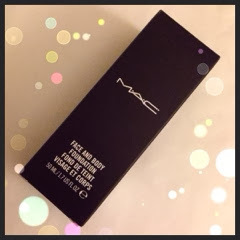 To mend my broken heart, I sort of spoilt myself to my first MAC purchase -- oh surprise, the Face And Body FOUNDATION! I've been wanting to try it out so badly so I didn't feel guilty for buying this one, it's just that I didn't really need to get it THEN especially since I had just bought that NARS Sheer Glow foundation last month! Oh well.. I suppose my blog will write itself by the end of this month. MAC in general are cheaper in India apparently. I was browsing around the store with a colleague who uses MAC and she was pretty stoked to get her stuff at a cheaper price. 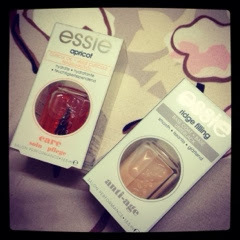 I suppose now there's more than JUST Himalaya products to buy from India..
Another purchase that I made abroad were these Essie cuticle oil and base coat! I was at the airport in Male, walking around to kill some time while waiting for the aircraft when I saw the Essie display. I was pretty excited! It was the first time I ever saw Essie products so of course I had to get something! After a quick look around, I decided not to get any of the nail polishes since I have loads of those but now that I've tried the base coat.. know that Essie has that wide brush that I love.. oooh I am so tempted to get some the next time I see them! Funny that I thought I was going to come home without spending a single dollar during my stay -- I stayed in my room all day, not a single step outside my room until call time because I was just SO SICK! -- and then bam! Essie display at the departures hall.. I'm still not a hundred percent, which blows. Roster's been bloody packed and flying with a flu and a cough is just not great. Apparently I am flying for 85 hours on a 28-days month.. That is a damn LOT if you ask me. And I am ending the month with a standby so I won't be surprised if I'll hit 90 hours by the end of it! It is just no wonder that I am sick, really..